Dr. McGinn oversees all Northwell Health medicine programs, with more than 450 full-time physicians, 1,500 voluntary physicians, 100 fellows, and 140 medical residents. As the organization continues to expand its mission as an academic medical center, Dr. McGinn is devoted to bolstering the Department of Medicine’s clinical research and educational enterprises by attracting and retaining talented faculty, mentoring and promoting physician-scientist/educators, and supporting the innovative ideas and research stemming from the talented young minds of tomorrow’s healthcare leaders. On the clinical side, Dr. McGinn leads the largest department within the organization where twelve medical sub-specialities work together to manage complex and diverse communities of patients in both outpatient and inpatient settings. Dr. McGinn has been recognized nationally and internationally for his pioneering work in evidence-based medicine (EBM), deriving and validating clinical prediction rules (CPR), and integrating these rules into electronic clinical decision support systems. He is the author of the clinical prediction rules chapter of the highly regarded JAMA series Users’ Guides to the Medical Literature and published nearly 100 articles with a focus on clinical prediction risk and decision-making in primary care. 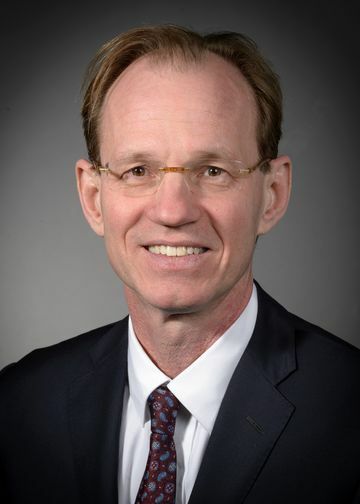 For over 20 years, he has taught, researched, and worked in the area of academic general internal medicine with a focus on providing high quality health care. As a PI or co-Investigator on several NIH-funded grants, he has the experience in leading health information technology grants and has effectively executed numerous research studies. Researchers have developed Evidence-Based Medicine (EBM) tools and attempted to embed this evidence into care. Challenges to integration included disruption to clinical workflow, complex guidelines that are tedious to memorize, and over triggering of clinical reminders in electronic health records. Dr. McGinn’s federally funded project overcame these barriers through usability testing and user centered design which help create a complex clinical decision support tool with high adoption rates. The success was attributed to the multiple iterations of rapid pilot testing and incorporation of feedback to design a tool that is user-friendly. Dr. McGinn’s current funded project has developed a usability and integration lab that will assist ambulatory clinics bring evidence based guidelines to the point of care. The research utilizes patient electronic health records to incorporate Clinical Prediction Rules (CPRs) into face-to-face patient encounters by selecting certain clinical situations where well-validated CPRs were available and likely to be needed on a frequent basis (i.e. Streptococcus pharyngitis, pneumonia, pulmonary embolism). Providers were randomly assigned an integrated CPR versus usual care into the point of care and evaluated the impact of this integration on doctor behavior and evidence-based decision making; our efforts helped in reducing unnecessary diagnostic testing and overuse of antibiotic prescribing. Press A, Ku B, McCullagh L, Rosen L, Richardson S, and McGinn T. “Developing a Clinical Prediction Rule for First Hospital-Onset Clostridium difficile Infections: A Retrospective Observational Study.” Infection Control & Hospital Epidemiology, Available on CJO 2016 doi:10.1017/ice.2016.97. Khan S, McCullagh L, Press A, Kharche M, Schachter A, Pardo S, McGinn T. “Formative assessment and design of a complex clinical decision support tool for pulmonary embolism.” Evid Based Med. 2016; 21(1):7-13. Kannry J, McCullagh L, Kushniruk A, Mann D, Edonyabo D, McGinn T. “A Framework for Usable and Effective Clinical Decision Support: Experience from the iCPR Randomized Clinical Trial.” EGEMS (Washington, DC). 2015; 3(2):1150.